EXCELLENT APT - WiFi - 2 vacancies - Great rates, up to 12 times on the card. LOCATED 10 MINUTES FROM THE BEACH OF THE DUNES TO FOOT AND 5 MINUTES OF THE BEACH OF THE FORTE DE CARRO (2 km). Beautiful property, new, furnished with dining and living rooms, two bedrooms and one suite (all with balcony, security screens on the balconies and ceiling fan), two bathrooms, kitchen, service area and two parking spaces , and is located on Avenida Teixeira e Souza but the concierge is on the parallel street, Rua Omar Fontoura, 994, just turn right on Rua Juscelino Kubitschek. 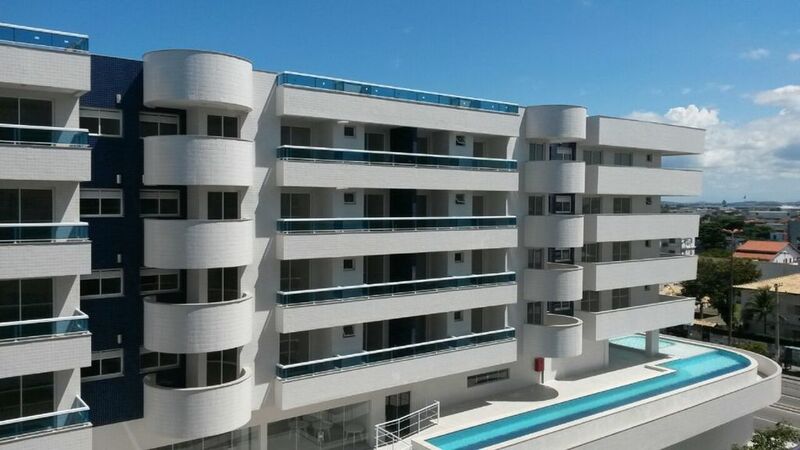 All building covered in ceramic and glass, just minutes from the beach, has a leisure area of ​​820sqm with Children's Pool and Adult Pool with lap, Showers and Deck. Concierge with access control and surveillance cameras. WiFi available in the apartment, at the concierge and in the leisure area. Located in the Braga neighborhood, a noble neighborhood of the city of Cabo Frio, which is known for its beautiful "Praia das Dunas", it is one of the most important districts of the city. In it is located the Forum, the Women's Hospital and was once the headquarters of the municipal municipality of Cabo Frio. The neighborhood offers wide and varied commerce, bank branches, supermarkets and pharmacies.  All rooms are fitted with security screens, installed on all balconies.  Living room with 32 "flat screen TV, sofa, dining table, 2 ceiling fans and balcony.  Kitchen with cabinets, stove, microwave, refrigerator, support table, water purifier, filter for gallon of mineral water, household utensils.  Suite with 32 "TV, double box bed, set up, clothes rack, ceiling fan and balcony.  Bedroom with double bed, coat rack, ceiling fan and balcony.  Available two single mattresses and a double mattress, single.  2 parking spaces, one covered.  Adult pool with sting and children's pool, shower and deck.  Minimum stay of 2 or 3 nights depending on the period.  Allowed to use the pool from 10 am to 6 pm.  Bring table clothes, bedding, face and bath towels.  Maximum occupancy allowed by the Internal Regulation for 8 people including children.  Method of payment: 100% in the reservation of the property.  Guarantee at the lessor's discretion: a deposit of 30% of the rental value to cover any extra expenses or damages caused.  In accordance with the Internal Regulations, it is necessary to send the data of the occupants of the property (full name, CPF and copy of the identification), as well as the data of the vehicles that will use the two parking spaces (make, model, color and plaque) .  In case of cancellation of the reservation, it must be done on working days, in writing, by the website Rent Season, and until 12:00 PM (Brasilia Time). The refund will be 100% for cancellation more than 60 days prior to arrival date. No refund will be made for cancellation of confirmed reservations at weekends, holiday periods and high season, according to Cancellation Policy published on the Vacation Season website. All balconies are fitted with safety screens. O apto muito limpo,espaçoso uma piscina enorme e total segurança. O dono bem simpático e prestativo. Muito bom e bem localizado. Imóvel conforme as fotos, tudo conforme descrito no site. Muito bom. Simplesmente adoramos o apartamento, muito bonito, confortável e bem localizado. Com destaque para a piscina que é um charme a mais. Obrigada pela cordialidade e recepção senhor Washington. Recomendo a todos e espero voltar em breve. Apartamento de alto nível e excelente localização. O apartamento é incrivelmente belo, claro e arejado. Todos os eletrodomésticos funcionam perfeitamente bem. O condomínio Blue Village possui infraestrutura completa de segurança e lazer, funcionários atenciosos e solícitos e o melhor, é permitido pets! Os Srs. Moacir e Washington foram extremamente atenciosos ao fornecer todas as informações sobre a região é também sobre a hospedagem. Ficamos extremamente felizes com o tratamento recebido. Apartamento muito bom, excelente, super indico!!! levar meu cãozinho yorkshire junto na viagem, saber que ele estava conosco tranquiliza muito nosso passeio e ele com certeza também adorou rsrs!! Tudo limpinho, bem organizado e espacoso, condominio ótimo. Está de parabéns, 100% recomendo!! O valor da caução é opcional, a critério do locador. A taxa de manutenção, conservação e limpeza de R$ 200,00 deverá ser paga junto com as parcela das diárias. Os valores das tarifas poderão ser negociados pelo Cel Vivo/ WatsApp (31) 99938-3153 - Moacyr.